PHOENIX AZ., Dec. 8, 2014 –­– Apache leaders and concerned citizens from Superior, Ariz., including a strong contingent of former miners, met on Sunday with touring members of the Huicholes: The Last Peyote Guardians film crew on the sacred ground near Superior, Arizona, where Rio Tinto and other foreign mining companies are planning a takeover of public lands for the installation of a massive copper mine. Congress is set to approve the giveaway of 2,400 acres of National Forest lands, including the burial, ceremonial and medicinal lands of the San Carlos Apaches, to Resolution Copper, a subsidiary of British-Australian Rio Tinto Mining Corp., a company with a long history of environmental and human rights abuses in developing countries. 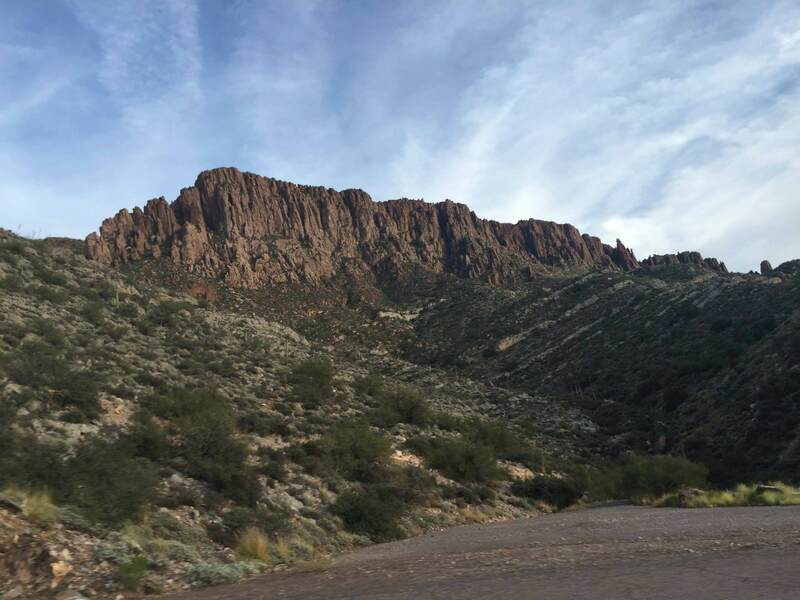 The open-pit mine would come within 1,500 feet of Apache Leap, a dramatic cliff face where, according to legend, 75 Apache warriors leapt to their deaths rather than surrender to the U.S. Cavalry. 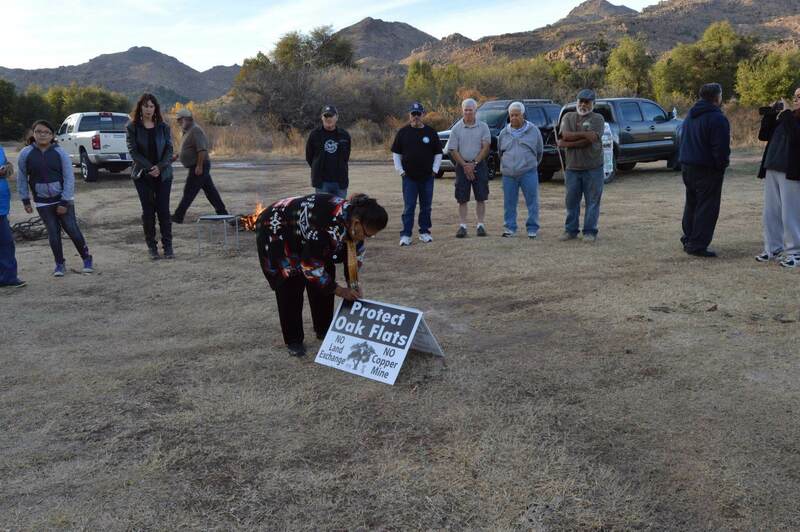 Apaches are concerned it would affect nearby Oak Flat, which from time immemorial has been the site of ancient traditional ceremonies like their sunrise dances that mark the passage of young girls to womanhood. It is also the place where they go to collect their medicinal plants and the acorns they use for everything from ceremonial uses to cooking. The land giveaway measure was quietly slipped into the National Defense Authorization Act (Section 3003 on page 1103 of a 1,600 page bill) and could be voted on as soon as Wednesday. Arizona Sen. John McCain was behind the deal, according to the Huffington Post. 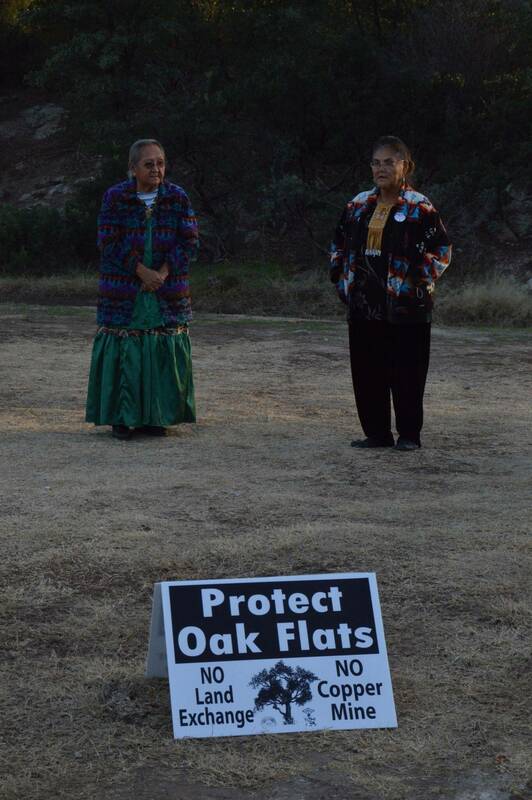 Oak Flat was placed off limits to mining President Dwight Eisenhower 60 years ago. “What we’re asking people to do is get on the phone and get on the internet and flood the White House with phone calls,” said Sandra Rambler, an elder from the San Carlos Apache tribe and sister of chairman Terry Rambler. 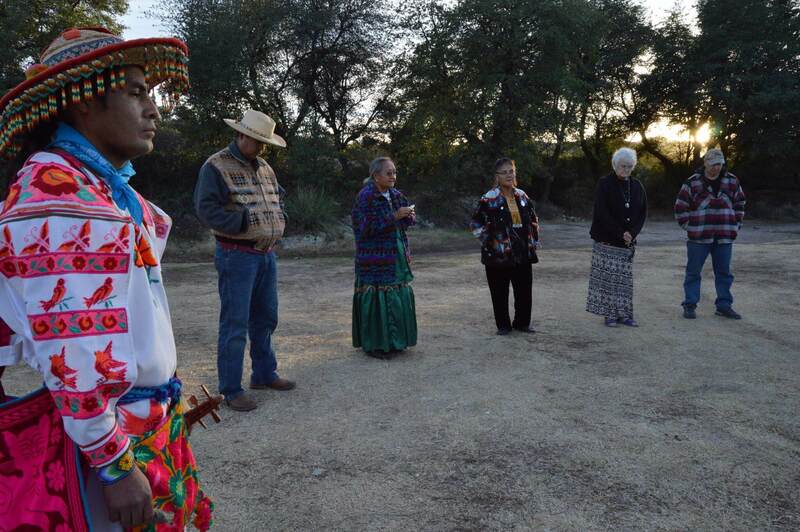 The group met at the invitation of the Last Peyote Guardians film crew, who immediately saw the parallels between the Apaches’ struggle and that of the Wixarika people to save their most sacred site, Wirikuta, from Canadian mining operations. “Whatever happened to the environmental impact studies, the cultural impact studies? McCain is a coyote himself, and we say, ‘Take these bad seeds away,’” said Rambler, who, along with several others present, declared their intention to chain themselves to trees and rocks to protect these lands from the bulldozers. Roy Chavez, former mayor of the town of Superior, founder of the Concerned Citizens and Retired Miners Coalition and a former miner himself, has been fighting efforts to mine these lands since 1998. Modern mining methods being proposed for the area will render it uninhabitable, he said, contaminating the water and air for generations to come. Chavez, who organized the meeting with the film crew and local indigenous and non-indigenous citizens, said the case of Wirikuta was like a mirror for the Oak Flat case – “smoke and mirrors,” he added ironically. “This is nothing more than “special interest” legislation for two foreign mining companies, circumventing established environmental analysis (National Environmental Policy Act-NEPA), with no true long-lasting economic benefit to the local region or nation”, he continued, “The proposed engineered “block caving” mining method (by Rio Tinto’s own admission), will result in a 2 ½ mile wide crater-1000 feet deep (completely destroying Oak Flat), and will also deposit over 1.6 billion tons of toxic mine waste tailings on an additional 8 square miles of federal public lands. HR-687 & SB-339 are both terrible examples of legislation that the mining companies have tried to pass for over a decade, and will negatively impact the United States and its people!” Chavez stated. Huicholes: The Last Peyote Guardians has been packing venues throughout the Western U.S. and Canada since it began its six-week, 20-city tour on Nov. 5 in Houston. After its Vancouver presentations, the tour will spend a week in Arizona and another week in Northern California. It won Best Documentary Film by the Red Nation Film Festival, the premier showcase for Native American and Indigenous film in the United States. For details about the various screenings visit www.huicholesfilm.com. You can also find information on Facebook: @Huicholes: The Last Peyote Guardians and Twitter: @PeyoteGuardians, and it can be rented online at https://vimeo.com/ondemand/huicholesfilm. Itinerary attached.